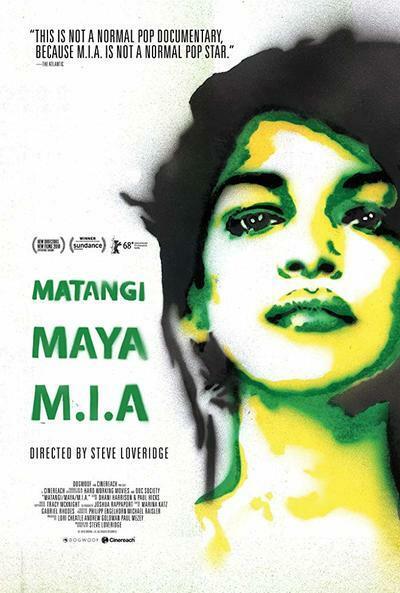 The most attractive feature of Steve Loveridge’s “Matangi/Maya/M.I.A.,” a sprawling and purposely chaotic collage of the British-Sri Lankan singer-songwriter-rapper-producer-political activist M.I.A.’s life, is the wealth of frank, never-seen-before footage shot by M.I.A. herself. In his Sundance-winning film, Loveridge is quick to reveal the larger-than-life artist’s lifelong aspirations to be a documentary filmmaker. The leads to an upbeat fusion that largely unfolds as a joint creative effort, even though Loveridge—an old personal friend of M.I.A. (birth-name Mathangi Arulpragasam) since their time together as classmates in an art school—is in the director’s chair. The amalgamation of their viewpoints gives “Matangi/Maya/M.I.A.” its unpredictable and at times, admittedly exasperating nature. It puts the ever-controversial M.I.A. in an intimate context perceived not only by herself, but also by her close friend, who complements Arulpragasam’s candid, camera-facing, self-interrogative recordings of over two decades with other archival material as well as his own work. This loose structure that liberally goes forwards and backwards in time makes sense for a profile of Arulpragasam, whose art and political stance continues to both fascinate and confuse people in equal measure (Loveridge leans a touch heavier on the outspoken activism side of her life). And while M.I.A.’s sonic style, music and unruly creative process are very much a weighty part of the documentary, “Matangi/Maya/M.I.A.” might still leave some of the musician’s most ardent fans craving for more than Paper Planes and Borders. But despite this minor slip, Loveridge mostly manages to dance along a satisfying narrative thread and portray Arulpragasam’s multiple cultural and artistic identities (as captured in the film’s invitingly rhyme-y title) with texture, as she goes from the daughter of a Sri Lankan Tamil resistance fighter to a refugee, immigrant and ultimately, a world-famous pop star. The film’s most touching segment arrives when a young Maya travels back to her Matangi days in Sri Lanka, visits her old home and her grandmother, and reunites with the origins of her existence before our eyes. Throughout the film, Loveridge handsomely engages with his friend’s journey from a sensitive viewpoint of clashing identities as an immigrant, making sense of her rebellious, untamable attitude even when she oversteps a slightly off-putting, bratty line. In that, Arulpragasam’s transformation from an aspiring artist with a lot to express to a bravely loud pop culture figure is fascinating to witness. If you have already thought that her much-publicized “middle-finger” during the 2012 Super Bowl halftime show (alongside Madonna) was outrageously overblown by the media, you will feel even more enraged after seeing it through the perspective of this film. Loveridge doesn’t spare his punches when it comes to underscoring the casual (and sometimes, not so casual) unfairness and even racism of the media in covering M.I.A. From Bill Maher’s patronizing interview to Lynn Hirschberg’s now infamous New York Times profile synonymous with “truffle fries,” the filmmaker systematically aims back at several of M.I.A.’s detractors. But that is not to say Loveridge entirely lets M.I.A. off the hook. He memorably poses her the question, “Why are you so problematic?” and guides the audience through some possible answers that might explain his friend’s inconsistencies as she grapples with newfound pressures and responsibilities her fame brings. It is rumored that Loveridge and his renowned subject had some tension over the years during the making of the film. But if you’re coming to their relationship as well as M.I.A.’s art with a mostly fresh pair of eyes (like I did), you might just miss the slight awkwardness between the two until a repeat viewing. For the most part, what will stay with you is the thoughtfully assembled story of a young, opinionated and infinitely talented immigrant woman who sings her way through a life of irregularities to keep a promise she once made to her grandmother.